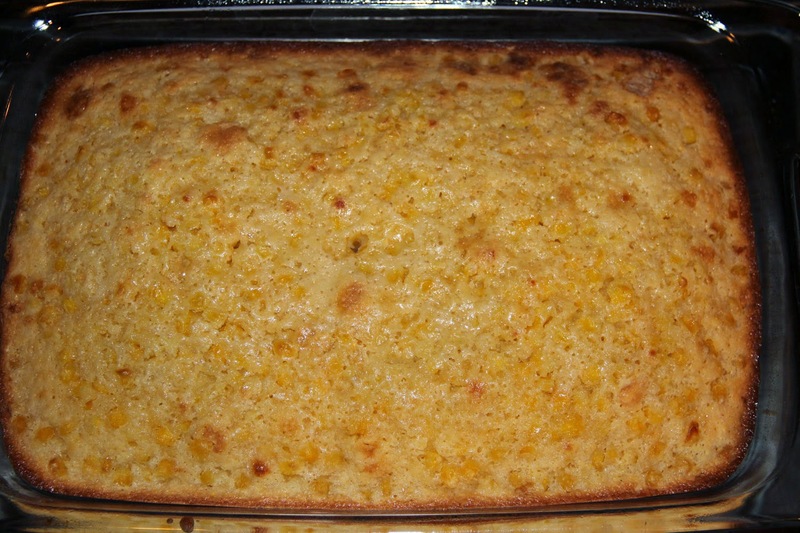 I was looking for a cornbread recipe that uses actual corn and it was a near impossible task. 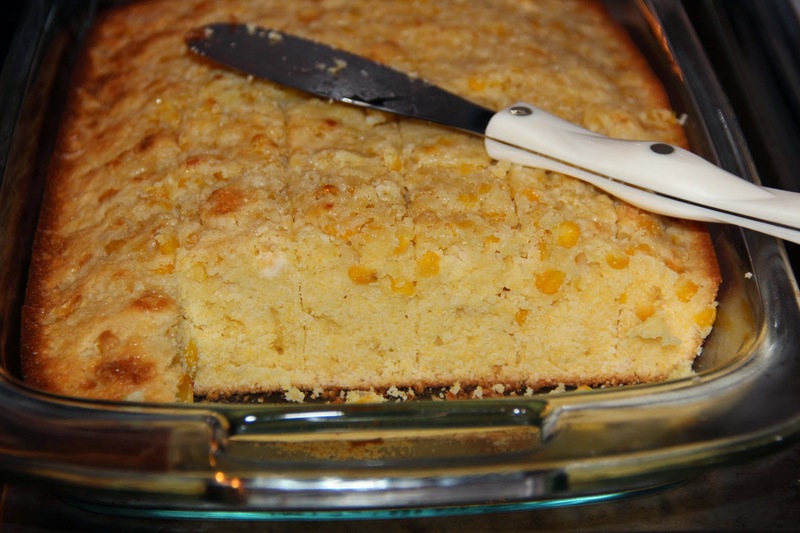 I remember having cornbread with corn kernels in the past, although, where that was escapes me. 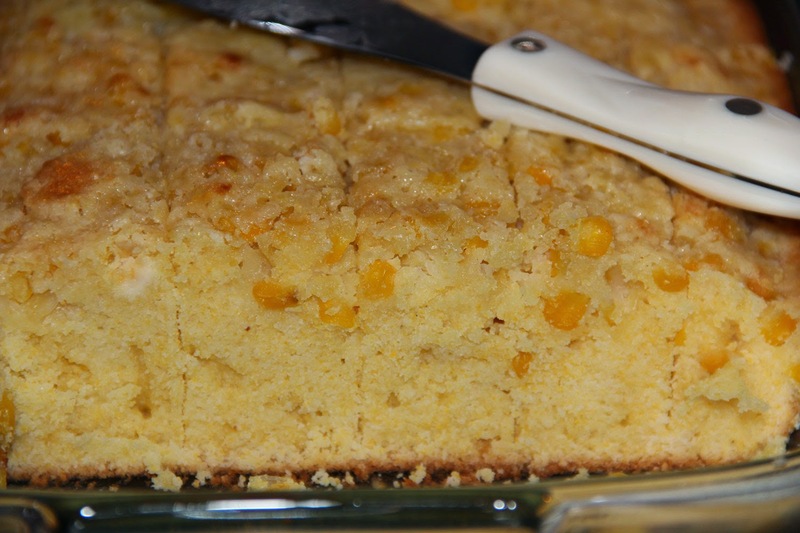 What I do remember about it was how delicious the cornbread was and the addition of some corn gave it that extra something special that I'd been missing in other cornbreads I'd had since. I ended up finding a recipe online and modifying it for my own purposes. I had no idea how this was going to work, but figured how badly can you screw up cornbread by adding corn, right? Preheat your oven to 350 degrees and grease a baking dish. This recipe makes a large cornbread so you'll want to use a 9 x 13 baking dish or something comparable. First, mix the cornmeal, flour, sugar, baking power, and salt. Pour in the oil, melted butter, eggs and half and half, then stir until moistened. Lastly, mix your corn into the rest of the ingredients. Pour the batter into your baking dish and bake for approximately one hour. Use a toothpick to check that it's cooked through in the center by inserting it and checking for it to come out clean. You can serve this warm or cold, with honey or butter, or even just plain. The bread itself does bake up rather dense which causes the corn kernels to mostly be at the top of the bread (as you can see in the photos), but it's still very moist and also very delicious. I've made this a couple of times now, once substituting some of the sugar with honey as the original recipe calls for. I didn't notice much difference. I also substituted gluten free flour at Thanksgiving to accommodate my niece and it was still very delicious and not noticeable that the flour was gluten free. Do you think using whole milk instead of half and half would work? Yes! Whole milk will work well. In fact, I think one of the original recipes I looked at used whole milk. Es ist ein Kuchen, es ist köstlich.